How to use three important question words in Portuguese: Who? When? How? Where to place the preposition when you ask a question such as “Who are you with?” It’s different in Portuguese. I have a lesson on how to use Onde (where) and the difference between Onde and Aonde. Be sure to check it out as well. Quem é você? = Who are you? Quem estava na festa? = Who was at the party? Quem pode me ajudar, por favor? = Who can help me, please? Quem você pensa que é? = Who do you think you are? Keep in mind that we don’t use helping verbs in Portuguese, such as do, does, did in English (see example # 4 above). Joana é a minha amiga que mora em Natal. = Joana is my friend who lives in Natal. Eu conheço muitos americanos que são fluentes em português. = I know many Americans who are fluent in Portuguese. Carla é a amiga com quem eu viajei ao Brasil. = Carla is the friend with whom I traveled to Brazil. Using quando is also pretty straight forward. Quando é a festa? = When is the party? Quando você vai ao Brasil outra vez? = When are you going to Brazil again? Quando é o seu aniversário? = When is your birthday? Como vocês dois se conheceram? = How did you two meet? Como se diz “feliz aniversário” em inglês? = How do you say “happy birthday” in English? Como você gosta da carne? Mal passada, ao ponto ou bem passada? = How do you like the meat? Rare, medium, or well done? Como é seu nome? = What is your name? Com quem você vai para a festa? = Who are you going to the party with? Para quem é este presente? = Who is this gift to? Com quem você está? = Who are you with? 5. Como é que é? In Brazil, we often add “é que” after the question word. It doesn’t change the meaning of the question and there are no situations in which it is mandatory or in which it shouldn’t be used. Adding or not adding the “é que” is a matter of personal habit. Additionally, the “é que” may add emphasis to the question. The context will tell if it is the case. Quem é que pode me ajudar, por favor? = Who can help me, please? Como é que vocês dois se conheceram? = How did you two meet? Como é que é? Repete, por favor, pra ver se eu entendi direito! = What is it? Repeat it, please, to see if I got it right! Now you just need to practice in order to use your questions words correctly in Portuguese. 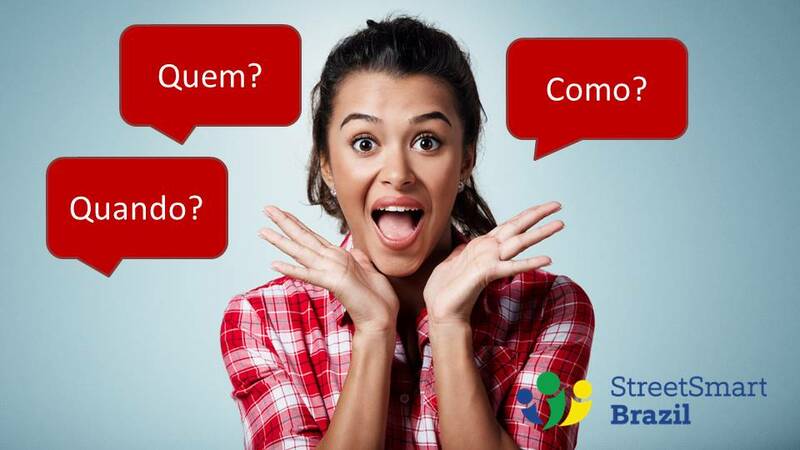 Book a lesson with a Street Smart Brazil professional to speak Portuguese that you are proud of! Gosto muitíssimo do seu blog. Só para conferir, Como é que é? também se diz em resposta, quando alguém está indignado ou ofendido, né? Quando você vai ao Brasil outra vez? = Where are you going to Brazil again? Should be; “Quando você vai ao Brasil outra vez? = When are you…? Why does the one use ser and other estar? There are rules to help distinguish when to use Ser and when to use Estar. It certainly is confusing when you come from a language that doesn’t have the two verbs separately. To answer your question: When you are talking about time and dates, you use Ser. When you talk about being somewhere, you use Estar.